At that point it was abundantly clear that one – I was so a mom and two – I had seen Cars way too many times! The Menace was in love with Lightening McQueen from the start, maybe it was the red? Maybe it was the speed? Maybe it was the wreckage? One of his first words was “Ka-chow,” which was what he named this little red hot rod. 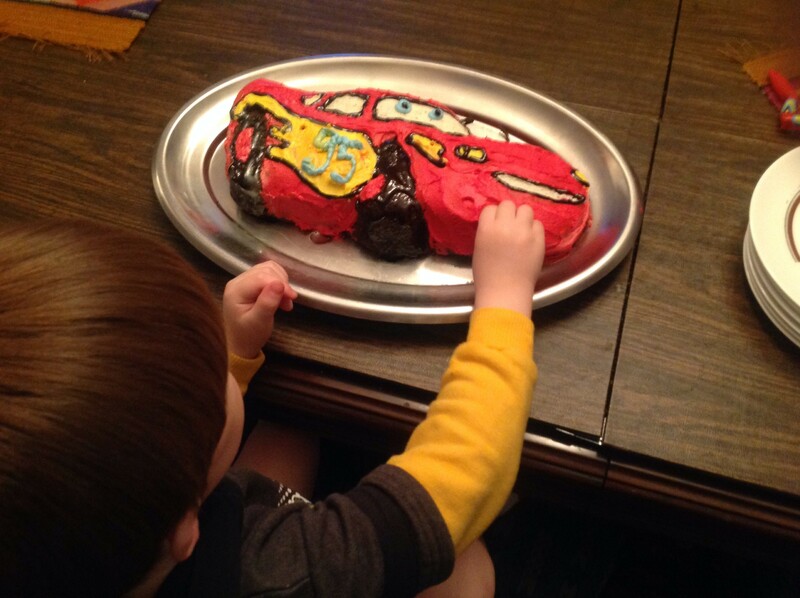 His first birthday was Cars themed, and my late wife attempted a generic Car cake but it was too deep to come out of the pan intact. Three years later he is still obsessed, and on his birthday he asked for Ka-chow again. As messy as it seems, cooking with my son has been one of the more relaxing activities we do. This is perhaps because I am a messy cook and since my wife died I have tried to adopt her carefree approach to cooking. On the morning of his birthday we poured cake mix and cracked the eggs. We looked like victims of a freak chocolate paint-balling drive by. However, once he was napping the real terror began. As my realism skills leave a tremendous amount to be desired I knew I could win The Piston Cup or just go down in flames. I had grandiose visions looking at his Lightening McQueen car toy, but now a bleak feeling was settling as I mixed up the butter cream icing. I was falling into the “I just want it to be perfect” parent trap. I attacked the windows and the teeth first, bemoaning the off white colour and consistency that picked up flecks of chocolate. Next I tackled the yellow headlights and trademark lightening streak. The food colouring made it easier to work with, but I was still sweating. Moving on to the red I opened the jelly like dye. For a while the icing remained hot pink but I was undeterred in my quest, I darn near added half the jar but I got it. Ka-chow red!!! I could hear The Menace stirring and sent Mom to distract him while I raced through the tires. I recklessly made a swipe at drawing the number 95 on the side of the cake. I heard my mother return and say, “There doesn’t have to be a number on it,” to which I registered a disembodied, unstable sounding response coming out of my mouth, “Yes, it does mother, that’s the whole point! However I was out of time. I felt defeated. I was a rumple of grass rolled, dirt streaked metal on the side of the racetrack, Mater, tow me to the scrap yard. Then a miracle happened, when I lit the three sparklers Ka-chow actually looked like he was throwing sparks as he barreled down the track, and I knew my fears were for naught. The Menace’s mouth dropped open and his face, for a lack of a less appropriate, term “lit up.” I have to admit I was actually pretty proud of myself – one for realizing my late wife’s dream of producing a recognizable Ka-chow cake and – two for bringing an undeniably beautiful expression to my son’s face. 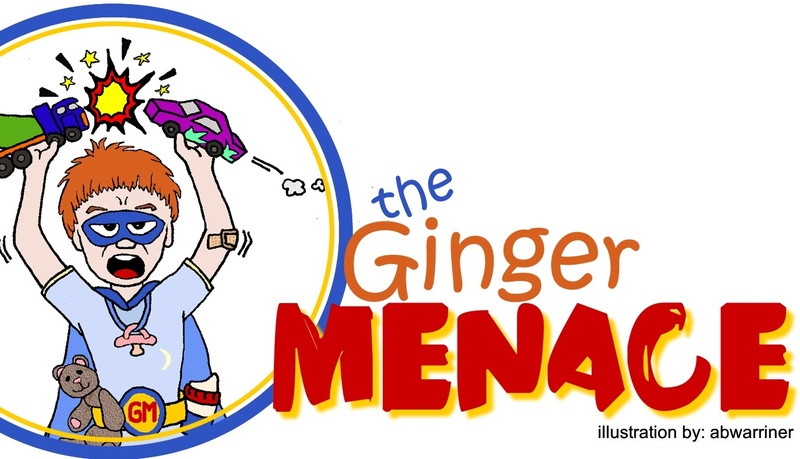 I hope you enjoyed this installment of The Ginger Menace, and to parents who would like to swap war stories about runny noses, potty training, and the joys of having children you can contact me at wilk.kelly@gmail.com. I suspect you and your families are well and getting excited to celebrate World Pride 2014. For those who are going to bring their kiddies too Family Pride activities and entertainment located at the Church Street Junior Public School (83 Alexander Street, southeast corner of Church and Alexander streets). This year, the space will be open to children and their families/guardians during the following times.